Whenever buying an audio device, we are not only hoping that it will last long but also that it will sound just the way we like it. No matter if we are buying headphones or speakers, if they are expensive or cheap, our hopes remain the same. We are constantly buying new devices different from the previous ones trying to find the one that will suit our needs and taste perfectly. Unfortunately, there’s one “small” problem – we don’t always know what we are searching for and this makes our search even more difficult. The perfect sound that we are trying to find is actually a specific sound signature and every pair of headphones and every speaker have their own. Whether we are going to like it or not depends on our subjective feeling. The headphones and speakers can be tested and characterized based on their accuracy, frequency response, SNR, distortion or some other features but, in the end, the main factor that affects their quality is the personal taste of every user. When you say that a certain pair of headphones doesn’t sound good, that doesn’t have to mean that the headphones are poorly manufactured and tuned. In some cases, it only means that they don’t suit your taste. If you walk into an audio store and try several different but similarly priced headphone models, you will notice that all of them sound completely different. This happens because the manufacturers are constantly trying to satisfy everyone’s taste by tuning their headphones in all different ways. Some devices sound quite flat and neutral while the others have a certain level of sound coloration and manufacturers do this because they want to satisfy different tastes and build the perfect headphones/speaker for every music genre. Yes, music genre actually matters because rock or hip-hop music sound better when played by headphones or speakers with exposed bass. Due to all these reasons, we have decided to write this beginner’s guide to sound signatures and try to introduce you to different signatures in order to help you find the one that suits you best. So, stay with us and find the way towards your perfect device. As you probably know, there are many ways to classify audio devices, especially headphones and speakers. They are classified by their shape, height, placement type, etc. but they can also be classified by the type of sound signature. We have said that every pair of speakers and headphones sound different but, generally speaking, there are only six basic sound signatures and, subsequently, six headphone/speaker categories. In order to help you find the right sound for you, we are going to describe all the six types in the text below. As the name implies, this sound signature is special because of the extra punchy and emphasized bass. The low frequencies are very exposed, louder than the others, and they cause the music to sound energetic and intoxicating. The sounds that focus the most on the low frequencies are mostly used for making hip-hop songs and they are also an inseparable part of electronic music. If you are a fan of bass headphones and bassy signature, you should look for a pair of Beats but V-Moda and some of Sony’s and Sennheiser’s models are not bad as well. When it comes to speakers, we advise you to get good subwoofers and find the right placement for them in order to improve bass quality and quantity. Just one more thing – be careful about boosting bass frequencies. If you exaggerate, it may result in boomy sound which is unpleasant for listening, and also cause the loss of all the fine details in the songs, especially all the details in the low-midrange region. The name itself may sound a bit strange but it’s actually quite easy to understand. 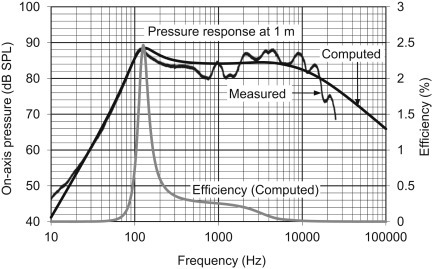 When the frequency response is shown in one line (frequency response curve), the line looks like the letter V. As the low frequencies are at the beginning of the line and the high frequencies at the end, this leads to the conclusion that the most important characteristics of V-shaped sound signature are very exposed bass and treble. While the bass is quite elevated and the treble is highly audible and easy to locate, the mid-range frequencies are placed somehow behind the previous two ranges. What we are trying to say is that V-shaped music brings quite neutral vocals that are overwhelmed by the bass and treble. Audiophiles don’t like this V-Shaped frequency response but this kind of signatures actually works for most of the users and many of them find it very pleasant, especially when they hear it for the first time. This happens because the booming bass and strong sparkling highs are the great formula for making exciting music that makes the songs brighter. This sound signature is perfect for reproducing hip-hop, rock, and pop songs while it can’t be recommended for listening to classical music and vocal-oriented or mid-centric music. As the sound is quite exciting and lively (also called the “fun sound”), the headphone users love it and this is the reason why headphones that have this sound signature are so popular. It is simply very pleasing for the human brain. However, you should be aware that headphones/speakers with this kind of signature may sound a bit unnatural to some people and that the vocals tend to sound hollow in some cases. In case you want to try a pair of headphones with this kind of sound signature, choose some of V-Moda models and you won’t regret it. Although it doesn’t sound like that, flat sound signature is very popular, especially among audiophiles. The word flat maybe doesn’t describe it well (it sounds more like a disadvantage than a positive characteristic) but, the flat sound actually means something good. This sound signature is called flat because the low, mid and high frequencies placed in one line are basically at the same level all the time. None of them is significantly more exposed or emphasized in comparison to the others and this is why it looks like the flat line (aka flat frequency response). Flat sound signature is characterized as natural sounding and, since the natural sound is very popular in the modern world, more and more famous manufacturers are trying to make the headphones and speakers that will sound just like the original studio recording. This is why Audio Technica, Beyerdynamic, AKG and many others are trying to produce the perfect natural headphones. Sadly, this is not possible, at least not completely because every speaker and every headphone model have their own special characteristic that can’t be completely eliminated. This is why they all sound different. Well, the truth is you can do something with speakers in order to make them sound more neutral – you can use differently shaped and sized speakers and place them in accordance with your room acoustics. However, you can’t do much about the headphone sound signature. Apart from being characterized as boring by some bass enthusiast, the greatest disadvantage of this sound signature is that it can’t be completely achieved with the current audio devices. Devices with this sound signature are appreciated among professionals because bright headphones are great at revealing all the imperfections in a recording. This means that if you want to hear every detail and every imperfection, these headphones are great for you but it also means that you can’t really use them for listening to poorly recorded music because it won’t be so pleasant. Bright sound signature means boosted high frequencies and higher than usual mid-range frequencies. The treble can be sharp but not too sharp to cause problems. In fact, boosting higher frequencies usually leads to clearer and less warm sound. You should be careful with these headphones because listening to this kind of audio content for extended periods of time can be tiring, unpleasant, and it could cause fatigue, which you definitely don’t want to experience. This happens because the human ear is more tolerant to lower frequencies while it is more sensitive to higher ones. This is why high frequencies that are listened at high volumes for long periods of time can cause health and hearing issues. If you’re searching for a pair of bright headphones, you should go for Beyerdynamic or Grado. Considering that we have previously described bright sound signature, if we wanted to describe the warm signature in short, we could say that it is the opposite of bright. If boosting the mid and high ranges adds brightness to your audio content, then boosting the mid and low frequencies adds a lot of warmth and smoothness. If you have a device with this sound signature, your bass will be emphasized just like the vocals, which makes saxophone or cello recordings extremely pleasant. Warm and smooth sound is one of the new tendencies in the music industry and more and more manufacturers are trying to tune their headphones/speakers to sound warm. Warm sound is commonly associated with comfort and relaxation, which is the main reason people love it (apart from the fact that this sound signature probably emphasizes vocals more than any other). However, be careful with this signature as it can bring too much bass into the song. If you’re searching for the manufacturer that produces warm-sounding headphones, try Beyerdynamic, Jabra, AKG, or Bose. This is probably the area where you have the greatest opportunity to choose and you can’t go wrong with any of the mentioned manufacturers. The last signature on the list is everything but the least. In fact, this is one of the things that all the headphone/speaker manufacturers tend to achieve. This sound signature is associated with perfectly balanced frequencies from the lowest to the highest, where all of them are naturally reproduced and balanced but still not enhanced and not too flat. They have some color but nothing too extraordinary. 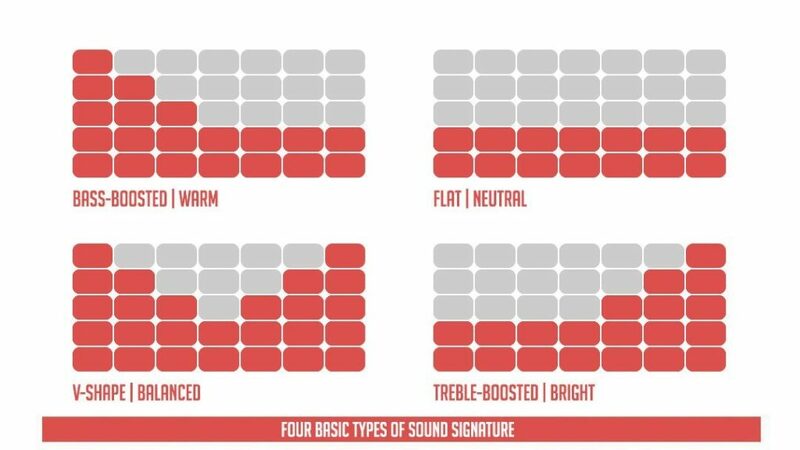 Actually, balanced sound signature is somewhere in the middle between bass and bright signatures. When you have a speaker or a pair of headphones with this kind of sound signature, you can hear everything perfectly. The sound is vivid and balanced, like a perfect mixture of instruments and vocals, of lows, mids, and highs. The problem is – this goal is hardly achievable and we can’t really say that we can think of a pair of perfectly balanced dynamic headphones. However, if you want to give it a shot, you should consider buying some Audio-Technica’s, Sennheiser’s or Beyerdynamic’s balanced models with dynamic drivers. They may not be perfectly balanced but they are certainly close. On the other hand, you can always try more expensive planar magnetic headphones which are famous for their balanced and extended frequency response. The go-to brands are HIFIMAN, MrSpeakers, Audeze, and OPPO. There is no definite and perfectly accurate answer to this question but we will try to conclude this story with a few clever ideas. In theory, users (and manufacturers, of course) of headphones and speakers tend to get/make a device, which is perfectly clear and reproduces all the details as naturally as possible. We are always complaining about too much or not enough loudness, about the lack of bass, boomy sound, hissing highs, muddy vocals, etc. The truth is – you won’t find a device that gathers all the positive characteristics because nothing is perfect and, finally, it doesn’t all depend on the device itself. The recording quality, speaker placement, room acoustics – all these things significantly affect the final product – the sound you hear coming from your headphones or your speakers. The best thing you can do is to find something that can handle the conditions it is used in and the type of music you are playing because not all the headphones are made for every type of music and not every speaker system can deliver the same performance in every room and with every music genre. Human ear (especially an average ear) and brain can’t really detect that many differences and nuances, and our brain is excellent at adjusting to different sound signatures and audio styles so we can trick it easily. The real sensitivity to these differences is developed through experience, which you can get only if you experiment a lot. You can’t really tell if your headphones are bright if you didn’t hear the warm ones. So, try as many as you can, learn to tell the difference and, after that, you will know what you want and need, and you’ll be one step closer to your perfect headphones/speakers.